Preheat the grill to the highest setting. Soak 8 bamboo skewers in water (or use metal skewers). Put the lamb, onion and red pepper in a bowl with 1 tbsp olive oil, the juice of ½ lemon and the spice mix, tossing to coat. Season, then thread onto skewers, interlacing the lamb with wedges of onion and pepper. Grill for 10–15 minutes; turn regularly. Meanwhile, make the chilli sauce. Put the tomatoes, chilli, sugar and vinegar in a small pan; simmer over a medium to high heat for 5 minutes. Dress the cucumber with the juice of ½ lemon and 1 tbsp olive oil; season. 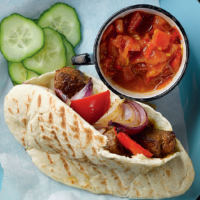 Serve with the kebabs, sauce and some houmous and grilled pittas, if liked.